Buy through MusicWeb 4CDs for the price of 3 £36 postage paid. In 1947 the first Nielsen symphony released was the Third played by the Danish Radio Orchestra under Erik Tuxen for Decca: you had to carry home six brittle shellac discs, each side lasting no more than three minutes. In 1974 the first symphonic cycle was issued (on six LPs). Now, the Danish label ClassicO’s ambition of recording the Complete Orchestral music is almost fulfilled pending the issue of the eighth and final CD. This review covers the first four discs. Nielsen’s momentous symphony-cycle conducted by Douglas Bostock has also been issued on four CDs by Membran “Quadromania” (MMBN 45319) and by Scandinavian Classics. 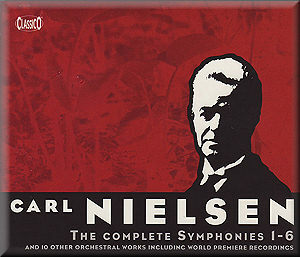 As with the project of BIS of the 1980s the scope here is Nielsen’s complete orchestral music. For the Swedish label Bis, Myung-Whun Chung completed only four of the six symphonies plus the concertos and other orchestral works. Incomplete they may be but incandescent and brilliant they still are. BIS released their set with Neeme Järvi, also conducting the Gothenberg Symphony Orchestra, but his 4th and 6th symphonies may best be described as professional and workmanlike. Having supplemented their symphonic cycle with the three concertos, ClassicO have recorded a final volume of orchestral music. It is to be hoped that this will make available for the first time music Nielsen composed for a Danish play, Moderen — The Mother[land] — written in 1920 to celebrate the post-war return of territories. The melodrama is said to be dated - I cannot comment here - but the haunting beauty of the music is confirmed by the fact that small excerpts have proved so popular that they are frequently played and recorded. In the search for the best symphonic cycle - if one can exist - the critics’ consensus is Herbert Blomstedt’s set of recordings with the San Francisco Symphony for Decca. This Swedish conductor is a committed Nielsenite, the label has a well-earned reputation for the finest sound engineers, and the set is self-recommending despite strong competition. Perfectionists must look further to individual issues noting the authenticity of three Danish conductors who were colleagues of Carl Nielsen and the Russian-born, Austro-German trained Horenstein who also worked with the composer. In 1927 Horenstein prepared the Fifth Symphony for two performances under Wilhelm Furtwängler. So which to choose between mono or modern? ClassicO’s “marketing handle” is their completeness of scores and their use of the Carl Nielsen Critical Edition of the symphonies. Only Michael Schønwandt’s cycle on Dacapo competes here and it boasts the expertise of the Danish Radio Symphony Orchestra. By May or June 2009, his entire cycle should be available on three Naxos budget CDs (vol. 1; vol. 2); not much more than the cost of one of the eight ClassicOs as things stand. Let battle commence! In love and war, battles are lost or won before they start; all is in the preparation. Maestro Bostock has done the deepest research; for example he has peered into the above-mentioned documentary recordings in their inglorious mono sound. He has gained much from the composer’s colleagues but he has not made slavishly modern copies. Neither has he helped the composer to say what he really meant, or should have meant, by imposing his own vision on the scores; he has respected the scores and (as stated) used the authoritative 1994-2009 scores. The choice of the Royal Liverpool Philharmonic was, I am told, artistic rather than opportunistic. Here was an orchestra with the right potential but without the baggage. Very risky; and congratulations to ClassicO for taking the risk, because it paid off. The playing is brilliant and idiomatic. It has the raw power that Nielsen needs, but here is my biggest surprise: I feared that this earthy quality and Bostock’s dynamism might drive the music … yes, it does, but the lyrical beauty so vital to Nielsen’s humanity is perhaps the finest achievement throughout this cycle. It is simply wonderful in combination with the masculine, even aggressive drive. I am passionate about the crusade that sound engineering should serve the music. Yes, one can perceive a great event from a flawed tape recording, but Carl Nielsen rightly denounced the crackling gramophone and the hissing wireless as leaching the vitamins from the music. It compromises the voices of fine instruments and artists; it loses dynamic contrast and detail. Rich harmonies, rhythmic patterns, dialogues within the orchestra, these and more are sacrificed by a poor hall acoustic and by low-fidelity. Now - hi-fi sermon over - I am happy to report that we have throughout excellent sound that captures Mr Bostock’s handiwork in fine and very natural detail. Many digital recordings are detailed but harsh, or even painful on the ear. This is a full and natural acoustic yet able to give analytical detail at the same time. Hats off to the producer Martin Cotton and engineer Tony Wass. It makes a big difference and favours this cycle above its rivals. On the subject of credits, let us here acknowledge the guiding hands of Knud Ketting who contributes the insightful notes. The ultimate test is artistic performance, and as I have stated without reservation the Royal Liverpool Orchestra rises to the occasion. It has its own signature, just as valid as any Danish orchestra’s if you agree with my view that these are European symphonies. Bostock is a true Nielsenite and the preparation and successful execution speaks to me as follows. Here is a new attempt to let the scores, or rather the composer, speak to the listener. The conductor is a performer rather than an interpreter; etymologically he conducts the current per (through); he does not stand inter (between). He inspires the orchestra with Nielsen not with Bostock! For example, in Bernstein’s acclaimed Fifth, the conductor is clarifying points by exaggeration. Bostock clarifies by balancing the orchestra, promoting ensemble; in short by pure musicianship. When I say Bostock is a true Nielsenite, indeed, one of a very small elite, I mean that he feels the pulse of the Danish composer with all the individual and idiomatic elements which have eluded and felled otherwise great conductors. In one respect he towers above them all: as Nielsen’s biographer I engage the musicologists with my proposition that symphonies 1, 3, and 6 contain many autobiographical elements. In his notes for ClassicO, Knud Ketting quotes a letter from Nielsen to Wilhelm Stenhammar who conducted Symphony No. 1 in 1910: “May I be permitted to thank you sincerely for your interest in this work, which lies far back in time and in my production, but which has always been very close to my heart, because it is very personally felt; yes, in fact far too personal for a symphony.” (my italics). The highest achievement of Bostock’s cycle, I say, is his musical closeness to Nielsen. Symphony No 1 (1892) is a wonderful performance; like the composer himself the orchestra come fully prepared from the first chord. We hear the triumphant arrival of a modest but brilliant young composer. Truly it has been said that no first symphony of a man in his mid-twenties has before or since rivalled its content and power. An ace card is slapped down, as it were, on the reception desk of European music. I will share my unbreakable association of the Andante with the teenage Nielsen on the high seas, looking back on the island of his childhood and forward towards his musical training and career in the capital city. Arguably it comes over more powerfully when played more at a more leisurely pace but the energy here may reflect Nielsen’s looking forward! Be that as it may, Nielsen’s Third Symphony (1911) is accurately described as the joyful expression of a man who is settled with a family and career. Here, in the second movement, human voices are brought in to transcend mere instruments to great effect. The third and fourth movements distinctly point to the music of the composer’s Sixth and most enigmatic symphony. In his life, Nielsen’s final symphony of 1925 was condemned and remained unpublished; I believe that the composer only performed it once. It held its secrets for many decades. Not until the second edition (1979) of Carl Nielsen, Symphonist did Robert Simpson begin to tackle its riddles and I am most grateful to the American musicologist Anne-Marie Reynolds for informing me that during the 1980s the foremost Nielsen authority, Torben Schousboe (who has now retired) apologised to her on Nielsen’s behalf. I stress this because I think 6 is the highest peak of Bostock’s achievement. In 1966 Eugene Ormandy recorded the work for CBS. He achieved a flowing beauty with his “Fabulous Philadelphians” rather than exaggerating Nielsen’s despairing cries and humorous denunciation of modern music. Here Bostock unveils a masterpiece of the 20th century which has found its true interpreter. Arguably it emerges as a tragic rather than triumphant symphony but this will be a perennial debate; is a glass half full or half empty? In the new recording the first movement is electrifying and one shares the composer’s pain. It has clarity and certainty, movement and pulse rather than mere fast tempi. Like Ormandy, it is never so rough that it throws listeners as the composer turns sharp corners. If 6 has emerged in the view of some disciples as Nielsen’s masterpiece, 4 and 5 will continue rightly to hold their places and popularity. Here the choice is bewildering and, in my opinion, the competition strong. I keep reverting to the Inextinguishable by Esa-Pekka Salonen and the Fifth by Bernstein (both on CBS/Sony). However, such is the diversity of opinion of people who have known these symphonies for decades that while I have singled out for praise maestro Bostock’s 1, 3, and 4, the esteemed reviewers David Fanning and Robert Layton have praised 2, 4, and 5! Competing sets in more economic issues will include Schønwandt from June 2009 when 4 and 5 will join his finely engineered, excellent performances: also in the new Critical Edition on three budget Naxos CDs transferred from the Dacapo label. I also recommend the budget reissues from Finlandia on three Elatus CDs (vol. 1): Finnish Radio Symphony Orchestra/Jukka-Pekka Saraste; these are outstanding performances. And last but not least, most critics’ choice - and I agree enthusiastically - the San Francisco Symphony/Herbert Blomstedt is currently packaged by Decca as two 2-CD sets whose interesting couplings restore to the catalogue Nielsen’s sparkling oratorio, Hymnus Amoris, recorded by the Danish Radio Symphony Orchestra under Ulf Schirmer. If you seek alternatives to the ClassicO issues at full price, then do not overlook Kontrapunkt, another Danish label with a distinguished Nielsen catalogue. Again, the extra money buys premium recordings and a lot of Nielsen’s valuable extra-symphonic music. On Kontrapunkt the orchestra is Nielsen’s home team, the Odense Symphony Orchestra. I confess to the critic’s problem: when you are enjoying them, you think they are the best. Certainly, Edward Serov and the Odense musicians seem to reclaim their own boy’s work. The biggest difference between ClassicO and Naxos in their use of the new Carl Nielsen Critical Edition is in the Fifth Symphony. Despite its importance in 20th century music, its publishing career was chequered. To secure international recognition Nielsen’s Third had bypassed the Danish firm of Hansen. The German publishers Kahnt paid the composer more but in 1914 the War severed communications in Europe. Appreciating the worth of Nielsen’s music, a wealthy friend and industrialist resorted to private publication of the Fifth Symphony in 1926. Nielsen was always short of time and it was not carefully done. In 1950 the conductor Erik Tuxen and the composer’s musical trustee and son-in-law, the Hungarian violinist Emil Telmányi set out to rectify the situation. Unfortunately the new score went too far in its corrections and suggestions with the conductor including his own markings. These issues are mentioned in ClassicO’s insert and more fully in David Fanning’s excellent Cambridge Music Handbook on the Fifth Symphony, published by Cambridge University Press, 1997. However, the musicians’ feel for a Nielsen symphony makes more difference to authenticity than small but welcome corrections. Symphonies 4 and 5 were acclaimed internationally from their first performances and the CD catalogue offers many and divergent successful perspectives. You may prefer the consistency of Bostock’s directness and clarity but I am more won over by the unearthly qualities of others. My point emerges immediately the Fifth symphony opens. Nielsen’s extraordinary wavering violas seem to me to require a mysterious air, almost held back, as if to reflect the creation of the cosmos. Nielsen himself pencilled on the score remarks about restive forces. But arguably Bostock’s clarity is admirable! You pays your money and takes your choice! Part Two of my critique of ClassicO’s complete orchestral works has been delayed. Volume 8 was recorded in 2007 but not announced at the start of March 2009. Vols. 5–7 (the concertos, etc) I paid for in full but have not received despite three months of chasing by unanswered e-mails, faxes, phone calls and a Danish friend visiting ClassicO’s premises with my proof of payment. If ClassicO is still available and you wish to make a trial purchase, try the frequent coupling of One and Six, Nielsen’s youthful and valedictory symphonies; Maestro Bostock is the one to buy. Arguably for the First, and as I stated above for the Sixth, a masterpiece has at last found its true interpreter. The hallmarks of the series are clarity and authenticity; along with energy comes the kind of beauty that Karajan once observed does not exist without precision.